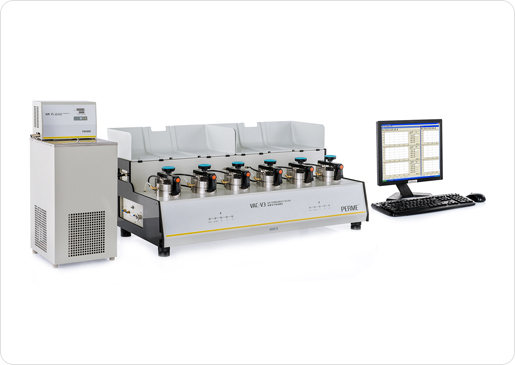 VAC-V3 is based on the differential pressure method, and is professionally applicable to the determination of gas transmission rate as well as solubility coefficient, diffusion coefficient, and permeability coefficient of plastic films, composite films, high barrier materials, sheeting and aluminum foils. The pre-conditioned specimen is mounted in the gas diffusion cell as to form a sealed barrier between two chambers. The lower-pressure chamber is firstly evacuated, followed by the evacuation of the entire cell. A flow of gas is thereafter introduced into the evacuated higher-pressure chamber and a constant pressure difference is generated between two chambers. The gas permeates through the specimen from the higher pressure side into the lower side. The gas permeability and other barrier properties of the specimen can be obtained by monitoring the pressure changes in the lower chamber.